This is a great way to make a tray full of little breakfast sandwiches all at once. 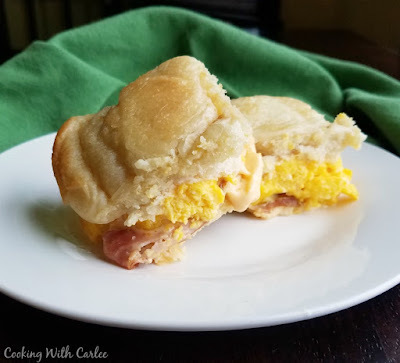 They are full of ham, eggs and melty cheese and the tops are golden and buttery. YUM! 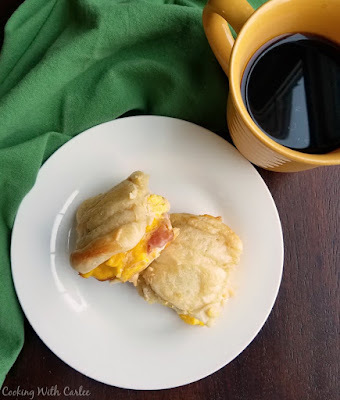 Breakfast sandwiches are one of life's simplest pleasures. The ingredients are affordable and simple. There really isn't much technique involved and they results are perfectly delicious. 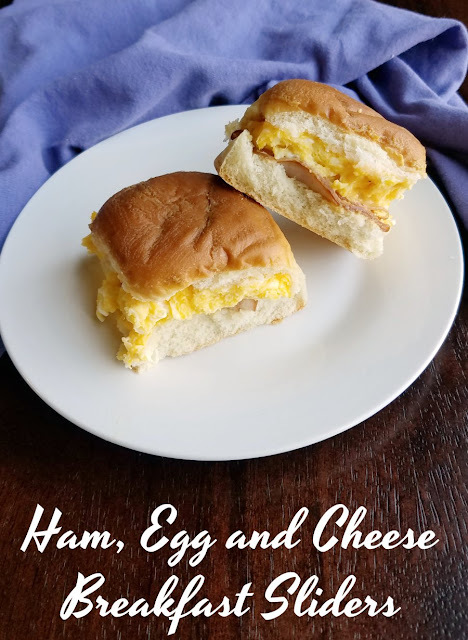 There is just something about salty meat, soft eggs and gooey cheese that make the perfect filling for a sandwich! By now you probably know that I enjoy hosting little parties in our home. Of course the centerpiece of most of our get-togethers is the food. I can spend weeks thinking about what the menu should be at each event. I decide whether the menu should be tied together by an ingredient or an overarching theme. It is fun to plan a party around a common theme like all things fondue. It is also fun to put together a pirate themed menu for a certain Little Dude's birthday. Truth be told though, two of my favorite types of menus are the brunch menus and appetizer buffets. So it is always fun getting to host our annual Christmas brunch open house. It is an informal affair that allows our close family to stop in and see what Little Dude got from Santa. Until earlier this year he was the only little one in town, so it was our way of sharing his bubbling-over excitement with everyone. Plus it gave me an excuse to cook! A breakfast casserole is always an easy way to serve a crowd. It holds and reheats relatively well also, making it nice when people are coming and going over several hours. But my husband refuses to like breakfast casserole. Maybe one of these days we'll get to him! That makes the task of pulling together a menu a bit harder. I don't want anyone to be slaving in the kitchen while everyone else is chatting and playing. So I try to pick a menu that can be done mostly in advance. This year I settled on breakfast sandwich sliders. They can be assembled the day before, so all you have to do the morning of the shindig is throw them in the oven. I actually made a few trays of them. A big one for the early crowd, when I assumed my brothers and their appetites would arrive. Then there were smaller sets that could be baked off later as more people came and more food was needed. You could definitely switch up the meat if you'd like. Small sausage patties or a few strips of bacon would be yummy as well, but I really like using thin slices of ham in these. You can also use your favorite cheese. I think a pepper jack would be delicious, but decided to go with the breakfast sandwich classic American this time. The rolls make for a fun presentation. Plus they are perfect on a brunch buffet like this because they make small sandwiches. That way you have room for some baked oatmeal too or maybe a cinnamon bun! If you are having them by themselves, feel free to have a couple! What are your favorite dishes to serve on a brunch buffet? As you can see from the pictures, I have tried both regular rolls and brown and serve rolls for this recipe. We prefer already browned rolls, though both were tasty. You can dye the eggs green for fun green eggs and ham sliders. Assemble these ahead of time, so all you have to do in the morning is bake them off. You could sub small sausage patties or bacon strips for the ham. Try your favorite cheese slices! Pepper jack, cheddar or cojack would be good as well! Spray a 9x13" pan with cooking spray and set aside. Beat together eggs and sour cream. Cook in a skillet greased with oil or butter until just set. Season with salt and pepper and set aside. Keeping rolls attached, carefully cut them in half horizontally. Place the bottoms in the greased pan. 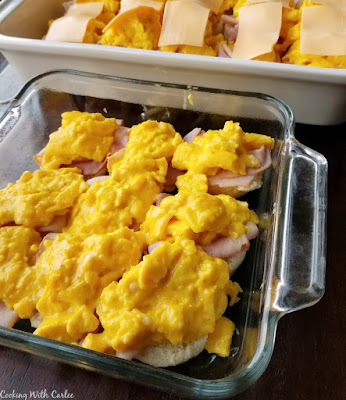 Layer with ham, then eggs. Top with cheese. Place tops of rolls over the fillings. Melt butter and stir in the Dijon mustard. Brush over the tops of the rolls. You can cover and refrigerate up to 24 hours at this point., or bake them right away. Bake at 350F for 20-25 minutes or until heated through and cheese is melted. Too funny, I am showcasing sliders tomorrow but girl, you nailed it with a breakfast version! Breakfast sandwiches are my families favorite and I wish I had one of these to take to work this morning. Have a GREAT day! yum! i made breakfast sliders for my inlaws for christmas breakfast. they had a syrup glaze and everyone loved them! 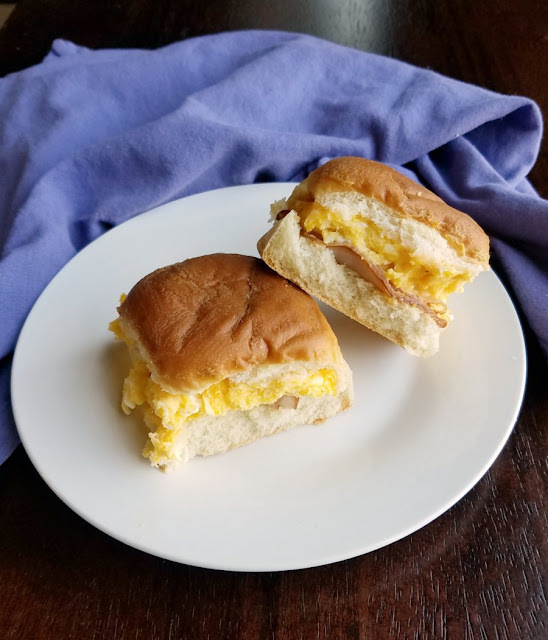 These breakfast sliders look so yummy. 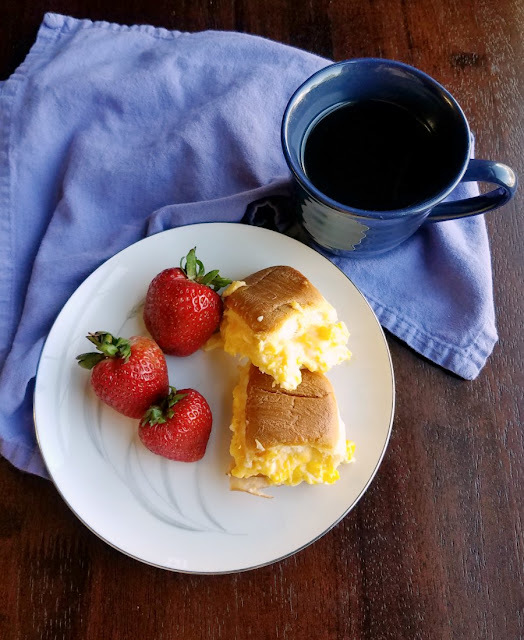 I love breakfast and am always looking for something different. Thank you for sharing. I hope you enjoy these! I am a big fan of breakfast food too, and anything that can be prepped ahead! I like the way you did these! Makes it easy, and I like easy. Thanks for sharing! Easy is my middle name ;-) Seriously though, especially if I am planning a big meal, the more I can get done ahead and easily the better! What a great slider and a great way to serve a crowd! Thanks so much for sharing your post with us at Full Plate Thursday this week. Hope you have a great day and come back soon! 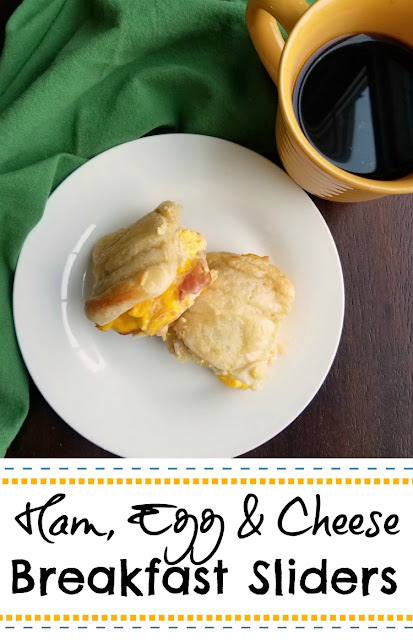 I love this idea and how easy these breakfast sandwiches are. I make breakfast at 5:30 so easy is awesome! Thanks for sharing your great ideas. Prepping them ahead makes getting them ready super easy for sure! I just learned we are hosting my husband's off road club for a camping event this spring. I am so making these for the guys breakfast! How fun! These will be perfect! I like that this can be made a day ahead and warmed up in the am. Makes for a less stressful am :-) Pinned. And a less stressful morning is worth its weight in gold!